Practicing their terror with ghoulish delight..."
The Haunted Mansion is a franchise that has grown around the long-running attraction at the various Disney Theme Parks, having spawned two movies (a critically disappointing feature with Eddie Murphy and an upcoming film by Guillermo del Toro), a video game and a short-lived comic series in addition to appearances in various Disney media. Having spent a long time in Development Hell, having even been first thought of in the earliest plans of Disneyland, with various stories considered and rejected, Walt eventually decided for a minimalistic approach on story and made the house a simple retirement home/boarding house for the spirits. Of course, this hasn't stopped many from speculating and creating their own interpretations about the nature of the house and its inhabitants, sometimes even being played with by Disney themselves through the mansion's assorted incarnations. Aborted Arc: The animatronic raven was originally going to be the "narrator" of the ride, which ended up being much better implemented with the "Ghost Host" being piped in through the Doom Buggy's individual speakers. The ravens, however, are still situated throughout the ride, flapping and beaking as if they were saying something. Ascended Extra: Imagineer Leota Ann Thomas (Leota Toombs at the time) was originally supposed to be a stand-in for the crystal ball effect. Though Eleanor Audley's voice was used as planned, the Imagineers liked Leota's performance so much that they ended up using it, and the charcter was given the name Madame Leota. Ascended Fanon: The names of the hitchhiking ghosts (Ezra, Phineas and Gus) originally came from cast members and were so popular in the Mansion's fandom that Disney eventually adopted them as official ones. Black Widow / The Bluebeard: One on the actual ride and one on a tombstone outside the exit. Bloodless Carnage: Despite all the implied violence, there is virtually no blood. Christmas Episode: During the holidays, the Disneyland version of the Mansion gets decorated up in a Nightmare Before Christmas theme. Comic Trio: The Hitchhiking Ghosts are generally portrayed like this in Fanon with Ezra (the skeletal one) as the schemer, Gus (the bearded convict) as the dumb one and Phineas (the carpetbagger) as the powerless one. Cultural Translation: To the Japanese, ghosts are a major element of myths and legend, so the Haunted Mansion in Disneyland Tokyo is in Fantasyland. The French, meanwhile, have a thing for the American Old West, and so Phantom Manor is in Frontierland. The Danza: Madame Leota is named for Leota Toombs, the Imagineer who provides the character's face. Her daughter has taken on the face role for Haunted Mansion Holiday. Dark Is Not Evil: A common interpretation of the Happy Haunts. This is more expressed in the spin-off materials. Constance is a notable exception. The Ghost Host is nothing more than a harmless Troll that loves getting a rise out of mortals. But not in the Paris attraction where he's the main villain. 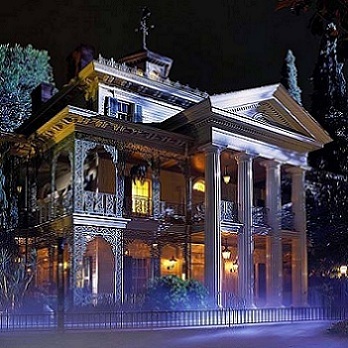 Darker and Edgier: The Phantom Manor of Disneyland Paris is much scarier and tells a story of macabre gothic horror. Dem Bones: Mostly in Phantom Manor. Later show up as enemies in the game. Doing It for the Art: Like everything else in the parks. This is Disney we're talking about. Driven to Suicide: The Ghost Host. Early-Bird Cameo: The Haunted Mansion show building just sat around in New Orleans Square for a few years before the attraction opened. The only sign something was brewing was an advertisement on the door asking for ghosts to apply for residency. Everything's Better with Monkeys: The plans for Mystic Manor at Hong Kong Disneyland involve a mischievous monkey in addition to supernatural occurrences. Evil Laugh: While he might not be evil, the Ghost Host provides a rather good one. The Phantom - who, unlike the original Host he's truly evil - in Paris gets one too, courtesy of Vincent Price. Evilly Affable: The Phantom in Phantom Manor. Giant Spider: The Disney World version used to have a couple of them, later used for enemies in the game. Gold Digger: Constance the ghost bride in The Haunted Mansion. Hellevator: The Disneyland version is actually this in the stretching portrait room. Hey, It's That Voice! : Plenty of Disney voice actors have taken part in the attraction, from Paul Frees as the Ghost Host, Thurl Ravenscroft as the lead singing bust, and Elanor Audley as Madame Leota. The Song and Story of the Haunted Mansion even stars a young Ron Howard as a teenager who visits the Mansion, with his companion being Robie Lester. The Ghost Host for Phantom Manor was originally Vincent Price, but changed to an actor who commonly dubbed him in French shortly after opening. Price still gets to do an Evil Laugh in the ride. I Will Wait for You: The original backstory to the ghost bride in the Haunted Mansion, taken further in the French version. Lightning Reveal: The ceiling in the elevator goes to black, and this trope shows the narrator for this ride had hung himself in life. And several paintings show a rather grim fate for many of their subjects. Multiple Choice Past: The Haunted Mansion's back story is pretty much whatever the Cast Members decide it is that day, the only solid thing being that the house is a retirement home/boarding house of the spirit world. One of the original story lines was about a blood thirsty pirate captain who built the manse for his wife who found out his secret. He then killed her, after which she came back to haunt him, which caused him to kill himself. Remnants of this story can still be seen in the mansion. Another one of the original stories was that it was the home of a murderous family known as the Family of Blood. The original record had this story on it. Off with His Head: The Headless Knight. Ominous Pipe Organ: The Haunted Mansion's Ballroom scene. The Disneyland organ is the actual prop from Disney's 20,000 Leagues Under the Sea movie. The foyer, where a slow funeral-dirge version of Grim, Grinning Ghosts plays, is much eerier. Unlike the ballroom scene, where the organ is in plain view, the source of the foyer music is left up to the guest's imagination. One-Woman Wail: The Bride's singing throughout Phantom Manor. The Other Darrin: The Holiday version and some spinoff material uses Corey Burton or Joe Leahy for the Ghost Host's voice, along with Susan Blakeslee taking on Leota's voice. Overprotective Dad: Henry Ravenswood of Phantom Manor. After discovering his daughter was to leave town after getting married, he's determined to stop the wedding at all costs. He dies in an earthquake that ravages the whole town, but his spirit goes on to murder his son-in-law to be from beyond the grave and decides to make his now depressed daughter suffer for the rest of her life in the abandoned house. Parasol of Prettiness: The ballerina in the stretching paintings, to help the contrast with the grim situations in the full paintings. Prop Recycling: Captain Nemo's organ in the ballroom, as detailed above. Pungeon Master: The Ghost Host. Ravens and Crows: A raven is placed throughout the ride, as noted in Aborted Arc. Rule of Scary: Of course this ride is built on this. Saved From Development Hell: As noted above. Shout-Out: Look closely at Madame Leota's book. That's the incantation from Blackbeard's Ghost on its page. A Victorian era attired ghost can be seen in the ballroom, drunkenly swinging from the chandelier by his cane. He was inspired by the character Pickwick from The Pickwick Papers by Charles Dickens. The organist is a shout-out to the 1925 film adaptation of The Phantom of the Opera. The one-eyed black cat that appears on the tomb of the composer at Walt Disney World's mansion (itself taken from an earlier draft of the attraction), is inspired by the gruesome Edgar Allan Poe tale, The Black Cat. Outside of the Walt Disney World Haunted Mansion is the tomb of the murderous Bluebeard (died 1440) and his wives. The inscription reads, "Six of them were faithful, but the seventh did him in." At Walt Disney World, In the back of the pet cemetery, there is a headstone of Mr. Toad in tribute to Mr. Toad's Wild Ride, which closed in 1998, to be replaced by Winnie the Pooh. The Corridor of Doors is a shout-out to The Haunting (based on the novel The Haunting of Hill House by Shirley Jackson), which a bunch of the WED Imagineers, and Walt Disney, went to see together. The human arm sconces in the crypt were inspired by the 1946 film La Belle et la Bête, the French film adaptation of the Fairy Tale "Beauty and The Beast". La Belle et la Bête was one of Rolly Crump's favorite films. The staircases in the Walt Disney World mansion is a shout-out to M.C. Escher's "Relativity". The pharmacist in Phantom Manor is a shout-out to The Strange Case of Doctor Jekyll and Mr. Hyde by Robert Louis Stevenson. The claw coming out at you in the clock hall is a shout-out to Nosferatu. Throw It In: The Hitchhiking Ghosts were tossed in at the last second. Troll: The Ghost Host, with mortals as his targets. Tuckerization: Master Gracey is named after the Imagineer Yale Gracey, who helped design the ride. Madame Leota/Dear Sweet Leota is named for Leota Toombs. Other tombstone names and who they are named for: Grandpa Marc is Marc Davis, Brother Claude is Claude Coats, Francis Xavier is X Atencio, and Brother Dave is Dave Schweninger. The Walt Disney World queue also has one for Mister Frees (Paul Frees, the voice of the Ghost Host) and features a Ravenscroft brand organ. Updated Rerelease: The ride has been redone several times with effects that don't break down nearly as often. The Walt Disney World and Tokyo Disneyland versions of the ride contain additional scenes not present in the Disneyland original. Phantom Manor at Disneyland Paris takes the loose bits of story present in the original ride many steps further to produce a full history for the house. Vader Breath: A door bulges out and breathes heavily. Visual Pun: The opera singers are a visual pun on The Phantom of the Opera. The Grand Ballroom scene contains a ghost of Caesar, as in "Great Caesar's ghost!" The Voice: The Ghost Host. What Could Have Been: The Haunted Mansion went through several different ideas. Early concepts included a hangout for horror-themed Disney villains, like the Lonesome Ghosts and the Headless Horseman, having a Raven narrate the ride, and a Hatbox Ghost which carried around a severed head as a character. It was also supposed to be a walk-through museum of the weird. Word of Dante: A lot of the so called backstory. Writer Revolt: The pet cemetery at the Walt Disney World attraction has a grave dedicated to the torn down Mr. Toad's Wild Ride. "There's a little matter I forgot to mention... Beware of Hitch-Hiking Ghosts!" "Hurry baaaaack...hurry baaaaack...be sure to bring your death certificate, if you decide to join us. Make final arrangements now. We've been...dying to have you..."